A 3-week old kitten is a sight to behold. They are a cute bundle of fur, with distinctive lanky limbs and a round potbelly. Their insistent mewling is a signature of this developmental period, as they learn to communicate and explore the world around them. At 3 weeks old kittens are completely mobile and will spend much of their time exploring the world around them. When they aren’t exploring, they will probably be eating or sleeping. Their growth and development place an enormous caloric burden on them. Your kitten will need to be fed well at this time to keep up with the demands of his body. 3 weeks is also the time when kittens begin to transition to solid food, making it incredibly important for them to be transitioned to a food source that provides adequate nutrition to support their continued growth. When figuring out what to feed a kitten at 3 weeks old, there are a couple of important things you should take into consideration. One of the most important things you can do when searching for a food for your kitten is to gain a better understanding of what cats eat. Cats are what is considered an obligate carnivore, meaning a cat diet must consist of meat. Unlike dogs, which are omnivores, cats can’t process fruits, vegetables, or berries. Rather, in the wild cats get their complete nutrition from the bodies of their prey. While this may be an unsettling fact for some of us who find it difficult to look past your cute and cuddly companion, it forms the basis for finding the best food for your kitten. Cats must be fed a diet that is rich in protein. Furthermore, that protein needs to come from the highest quality meats possible. This should be combined with consciously avoiding foods that have starchy vegetables, such as corn fillers or sweet potato, or fruits or berries, as these are not nutritionally necessary for your cat. Understanding these fundamental principles when selecting cat food and following a new kitten checklist will help guide you towards making the best decision for your specific circumstances and cat’s palate. 3 weeks marks the point that your kitten is beginning to be transitioned to solid food. In most cases, this means that you are beginning to incorporate increasing amounts of kitten food into his diet to supplement milk from his mother or an artificial source. First, understand that kittens need to be fed different food from adult cats. Kitten formula food adheres to a much more stringent nutritional profile than standard adult cat food. This is because kittens, when adjusted for body weight, require roughly twice the amount of calories that an adult cat does. In order to meet this caloric demand, and provide the vitamins and minerals necessary to promote proper development, kitten food is formulated using more nutrient dense food sources. Kitten formula is designed to exceed thresholds set by the American Association of Feed Control Officers (AAFCO). That means that food labeled as specifically for kittens is intended to meet their needs for proper development. A good starting point when looking for food for your kitten is to look for products that have been studied and approved in feeding trials by the AAFCO, as that will be an indicator that the food is nutritionally dense enough to support the growth of your kitten. 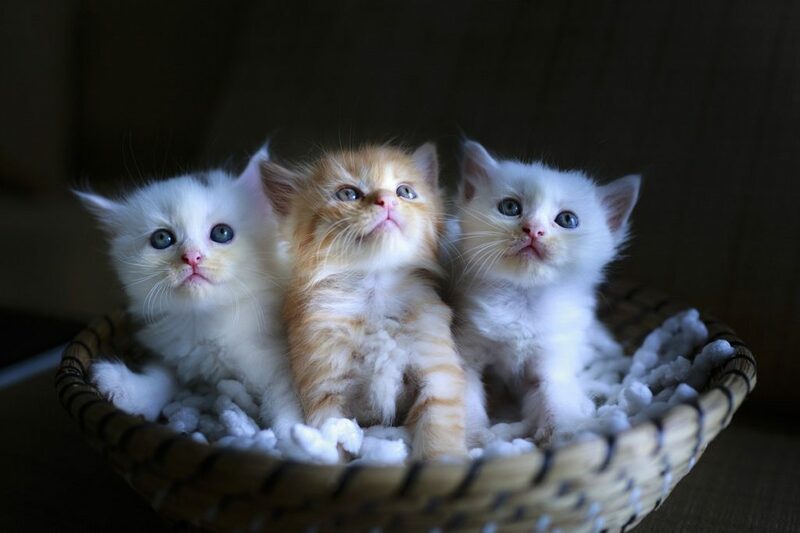 One further thing to note is that in addition to kitten formula, pet food products that are intended for “all life stages” also meet the minimum nutritional profile necessary to support the growth and development of kittens. When transitioning your kitten to solid food, it is important to take it slow and exercise patience. Kittens will need to eat much more frequently than their adult counterparts. Expect to feed your kitten between 4 and 6 times a day during this period. Gradually increase the proportion of solid food to their milk source, eventually completely transitioning them to solid food at around 8 weeks of age. Some people supplement kitten food with finely minced cooked meat as a way to encourage their kittens to transition to solid food. It is also recommended to consult with a veterinarian regarding any complications you may encounter or questions you may have with your cat nutrition checklist. Your veterinarian will also be able to provide you with some guidance regarding food products, providing peace of mind for new owners.